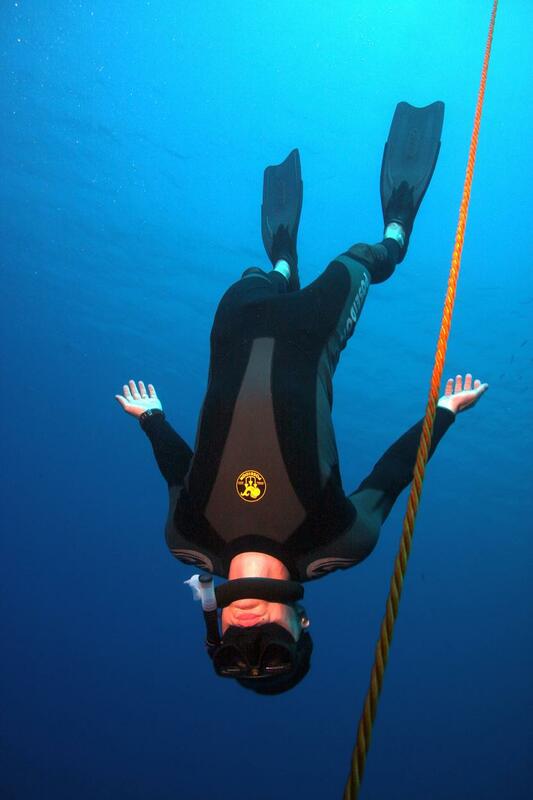 A few days before the record attempt I tryed for a new personal best in constant weight.Last year I was diving 78m in that disziplin and after a day off rest (I had breakfast with girl in Hilton)I felt strong to try for 80m.The warm up FRC´s felt so good…I went down to 36m on halt full lung very easy.The Bloodshift felt so good.Then we set the robe. 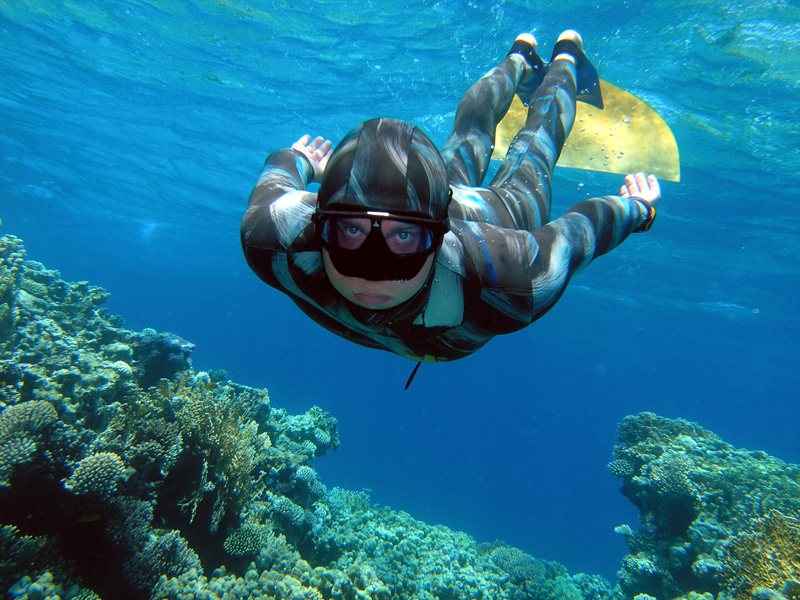 On the dive I felt very calm. The falling part was the best. 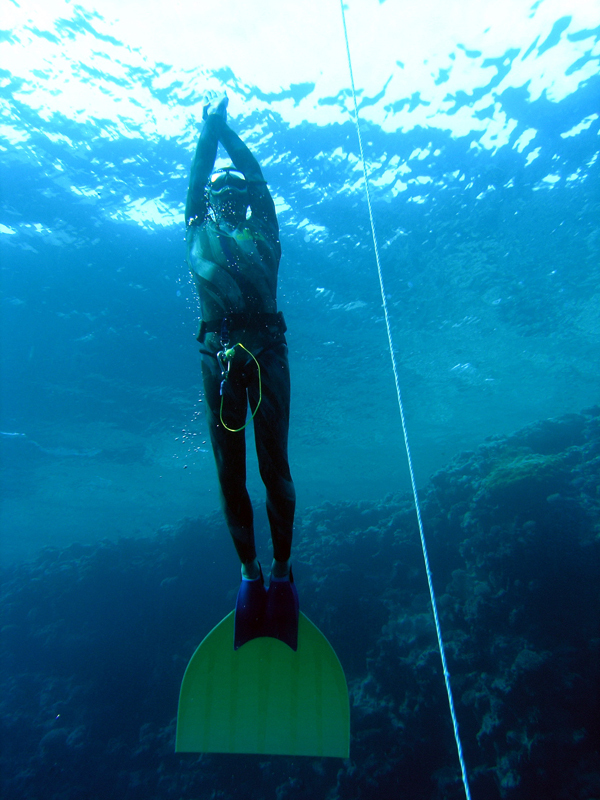 My ears worked as they should and I reached the bottom weight and bend my arm to getas much depth as possible.The way back up felt good…I was clear at the surface.Then suddenly I was very happy to archive a 84m dive in Constant Weight. I´ve never been that deep. I felt quite nervous the day before the attempt. I tryed for 75m dive and I made it very easy. On the day before the record attempt my girl and me felt of the motorbike and we got some scars. Of course I got mine on my foot. It burned a lot.Now I was even more nervous and not sure if I could reach my goal. All my confidence as gone.On the record day was okay. 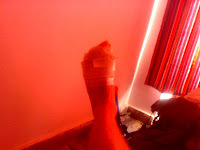 I coverd the scar with some vaseline so the pain was aceptable.The warm up dive was very good and all the setup was made ready for me try. The judes Linda and Katya, the camera man Leif and saftey Marek and Flavia were in positon.4 Minutes until official TOP.I did my last breathes and made my way down into the blue abyss.It was very nice…no problems with ears, good bloodshift and pure calmness. Thats how a dive should be.On the bottom weight I was searching for the TAG and after a few second I found it on the BOTTOM PLATE :-)The way up was easy. Back on surface I performed a perfect surface protocol and the I had THE RECORD.Exactly one year since the last record.I was very happy that you could kiss my girl again. 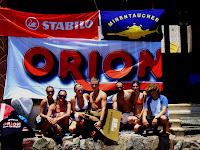 I´m very proud that this CHARITY DIVE raised almost 2000 Euro to Foundation witch support mine victimes all over the world. The day after the record attempt we went to sharm to try the sled.10 years ago I was watching the BIG BLUE with eyes wide open and impressed by those pictures.Now 10 Years late I could give the sled diving a first try.On the first dive I went with Linda and she showed me how everything works. 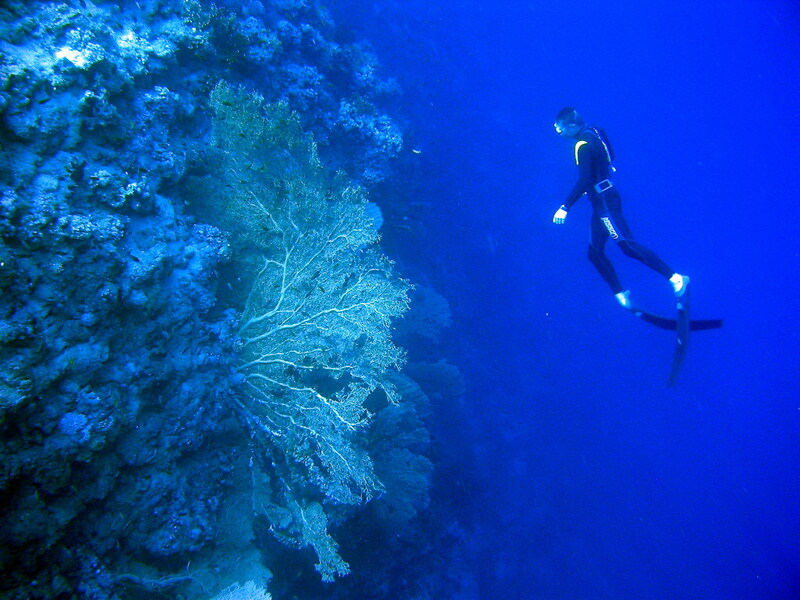 We managed a 40m dive.A few dives later Marek and me went together down to 80m. We were in the middle of a tuna swarm. It was very nice.I realised that I still had no contractions. So I was asking for a 90m Dive. The rope was set and I did my breath up.3,2,1 and the sled went into the abyss. 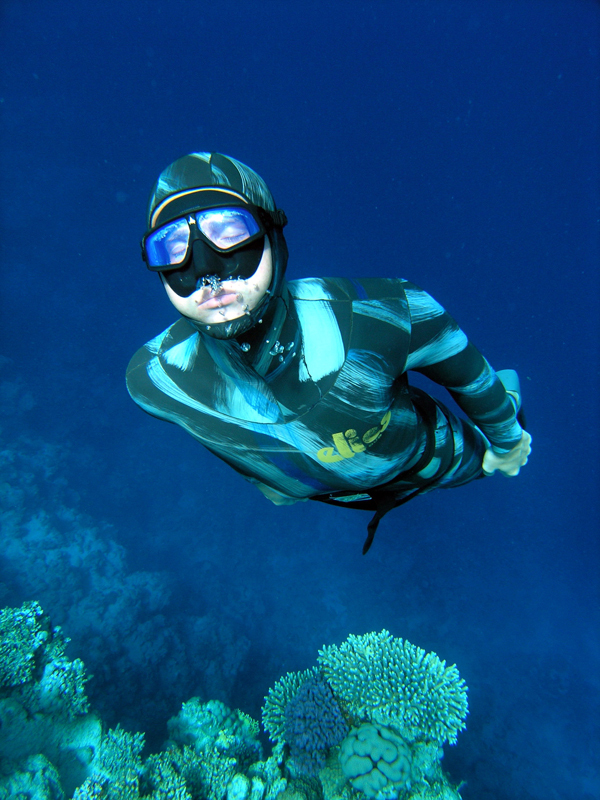 It was freediving FORMULA 1. The light went darker with every meter.Then the bottom. I was looking on my watch and saw 88m. The I was climbing down the sled and did some bending.I finaly had 91m on my watch. Then I startet to infalte the ballon. The way up was really fast and nice.Adrenalin was all over my body. Back at the surface I still had no contractions but we stopped diving.The risk of DCS was to big.Afterwards I realised that I was 30 seconds between 88m and 91m. 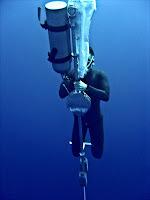 I never experienced that much in such a few days during my whole freediving carrer. And then we went into the water for a special experience. Mark rented a DIVEx Scooter for crossing the arch. After a few warmups he did his try and finaliy he did the arch. Next was Marek…a warmup to 43m and the CROSSING the Arch!!! The dive was great….It went down to 62m and then I saw it…thousands of small fishes were into the cave and the light was beautiful. 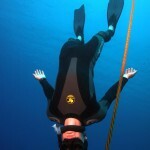 During the whole dive I did´nt even had contractions. The divetime was 2:20 min.